When your noodle sounds like a manga hero (and I think it rightfully is) it’s bound to be awesome. It’s been a long while since I touched this instant noodle section of my blog. I’m just… well I’m busy but I’ve also been quite absentminded when I eat my instant ramen. I just eat it, basically. And then I realized “Ah! I could have blogged about that!” Hence this is the 4th of supposedly weekly adventure into ramen that just didn’t happen. Well, I’ll try to make 52. Hopefully, I do! My good friend Yuecchi sent me a care package of what has become one of my most favorite instant ramen. I’m not a big shoyu ramen fan but this one has knocked me off my feet. Nissin’s Raoh Shoyu flavor ramen is possibly one of the smoothest and unctuous ramen I’ve ever tasted. Just… looking at the picture above is bringing back flavors in my mouth. My experience of shoyu ramen is commonly quite simple: it tastes like soy sauce. Surprisingly, I can’t say the same for Nissin’s Raoh as it has a really earthy flavor that’s mildly porky, beefy, chickeny, and fishy all at the same time. The smell is quite distinct as unlike other shoyu ramen which smells of sesame, this has a strong pungent flavor of deep dark soy sauce yet one that tastes surprisingly light. By light, I mean, it doesn’t have that intense broth aftertaste that you usually get in tonkotsu ramen. Nor does it have an oily afterfeel because of the broth. 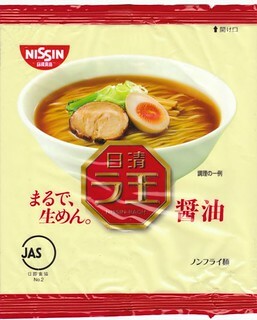 Instead, Nissin’s Raoh has a flavor does cling in to your mouth for a bit, enough to leave a very fond memory that makes you think “Ah, this is some bloody good soup and ramen,” but not one that you get sick of after a few sips. If you love strong flavored shoyu broths with a great balance, I highly suggest this ramen. Plus the noodles. Oh god, those wonderful thin noodles. I’m a big fan of thin noodles so this is right up my alley. Preparation is quite easy. A cup and a half for the broth, let it boil, cook the noodles for 1 to 2 minutes, then serve. 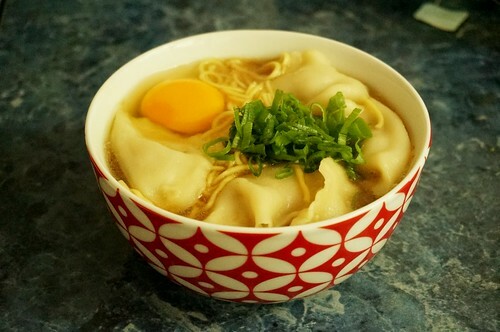 In the picture above, I cooked it with some gyoza. I topped it with raw egg (yay for salmonella) and spring onions. If you worry about the raw egg, well, what I really do is I just swirl it around the hot broth and make it better. I’d go for this ramen over and over again and I literally made so many sad faces just because I ate the last one. It’s lovely. Perhaps one of the most elegant flavors I’ve ever tasted in ramen. That said, I want to try the shio and miso ramen flavors someday. I’m a bigger fan of shio ramen so that might be a mindblowing experience. Hi, do you know the ingredients that go into Nissin’s Raoh Shoyu Ramen. I have the pac but can’t read Japanese.